"I don't believe too much in originality...you learn art from other art and then looking into somebody's face or landscape is the point of departure to do your work of art." (TORONTO - January 25, 2010) Driven by an appetite for experimentation, Paterson Ewen created powerful and influential works that bridged the worlds of painting and sculpture. The Art Gallery of Ontario is pleased to present Paterson Ewen: Inspiration and Influence. Curated by Matthew Teitelbaum, the AGO's Michael and Sonja Koerner Director, and CEO, the exhibition will be on view from February 8 to June 19, 2011. "It is an honour and a pleasure to present this show highlighting the works of one of Canada's most accomplished and admired artists," says Teitelbaum. "This is the first time Ewen's works are being showcased alongside the colleagues and friends that influenced and encouraged him, resulting in new ideas and breakthroughs in creativity. In the end, Ewen's achievement is his own, and it is monumental." With over 80 works by Ewen in the AGO's permanent collection, the Gallery prides itself on being the central collection for the study and enjoyment of works by the artist. Paterson Ewen: Inspiration and Influence is the first major showing of his work since his death in 2002, and the first at the AGO since 1996. Paterson Ewen: Inspiration and Influence features 88 works, including major highlights from the AGO's collection, together with works by the community of artists and movements that influenced him. The show contains 38 works by Paterson Ewen, six of which have never been shown before; 27 works from Ewen's private collection, gifted to the AGO by Ewen's wife Mary Handford following his death in 2002; and 23 works by Ewen's contemporaries, including Royden Rabinowitch, Goodridge Roberts, Paul Émile Borduas, and Philip Guston. 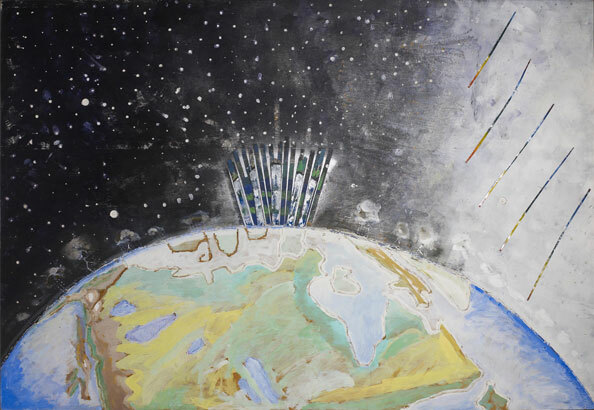 Key works of the show include Ewen's first ever completed painting Gonor, Manitoba; significantly scaled works on plywood completed during his time in London, Ontario, including Flying Rope; Precipitation; Cosmic Cannibalism; and one of Ewen's most recognizable images, Halley's Comet as Seen by Giotto. The catalogue titled Paterson Ewen, edited by Matthew Teitelbaum, accompanies the exhibition and was produced for the AGO's presentation of Ewen's work in 1996. Catalogues can be purchased at shopAGO for $65. Paterson Ewen: Inspiration and Influence is generously supported by Gretchen & Donald Ross. Other exhibitions to look forward to in winter/spring 2011 include Black Ice: David Blackwood Prints of Newfoundland from February 5 to May 25, 2011; Inuit Modern: The Esther and Samuel Sarick Collection from April 2 to August 21, 2011; and Abstract Expressionist New York from May 28 to September 4, 2011. Paterson Ewen was born in 1925 in Montreal, Quebec. He attended McGill University where he first studied geology and later fine art. From 1948 to 1950 he studied at the School of Art and Design at the Montreal Museum of Fine Arts under the instruction of Goodridge Roberts, Arthur Lismer, and William Armstrong. While in Montreal, he was connected to artists of the Automatiste movement, such as Jean-Paul Riopelle and Paul-Émile Borduas, and became a member of the Non-Figurative Artists' Association of Montreal in 1956. In 1968 he moved to London, Ontario and began teaching at the Visual Arts Department of the University of Western Ontario in 1972. It was in London that he changed his method of making art into something of a much larger scale, rooted in the use of non-traditional materials. He started working on plywood instead of canvas, using a router to gouge out powerful images of earthbound and celestial phenomena. Paterson Ewen's work can be found in many public institutions, including the Art Gallery of Ontario, the Museum of Contemporary Canadian Art, Toronto, the National Gallery of Canada and Musée d'art contemporain de Montréal. He was chosen to represent Canada at the 1982 Venice Biennale, and his numerous honours include the Chalmers Award for Visual Arts and the Toronto Arts Award. Ewen died in 2002. This bibliography updates the comprehensive bibliography (see pages 167 – 180) that was provided in the catalogue for the Art Gallery of Ontario exhibition Paterson Ewen, ed. by Matthew Teitelbaum and co-published by the AGO and Douglas & McIntyre in 1996.